Due to the growing popularity of the 11 specially adapted bikes in Stockwood Park Athletics Centre, Luton for those people with disabilities or special needs who want to cycle, we have expanded the programme to provide session times on three days: currently Monday, Wednesday & Friday. Sessions are subject to availability, but we do take group bookings as well as offer pay as you go sessions for individuals/families/carers where possible. Please contact the Athletics centre on 01582 722930 for more information. Learn to ride sessions for children are also available on Fridays after school. Session times for this new activity have not yet been agreed and will depend on demand…so please just email alison@teambedsandluton.co.uk if interested. Alternatively there is a smaller fleet of adapted bikes at the Forest Centre & Millennium County Park in Marston Moretaine, Bedford which are available for hire from the Cycle Hire Shop. To book, please call on 01234 767037. The address is: Forest Centre & Millennium County Park, Forest of Marston Vale, Bedfordshire, MK43 0PR (sat nav – use MK43 0PS) or click here The Forest of Marston Vale. 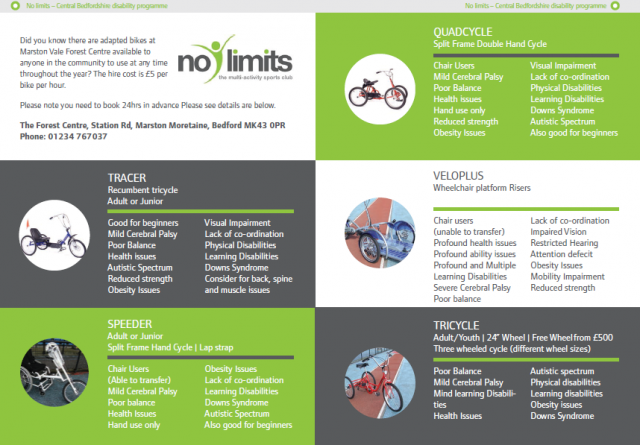 Our range of adapted bikes for those with special needs or disabilities to encourage fitness. These adapted bikes are available to hire in Luton from Stockwood Park or Marston Vale for groups or individual sessions.